Thumbay Hospital in Dubai is top-class multi-specialty hospital in Dubai providing multidisciplinary medical services, and is owned by Thumbay Group which is one of the largest healthcare providers in the area. The state-of-the-art facility has a capacity of 150 beds and offers excellent outpatient, inpatient and critical care services to the all the patients. The hospital has made its mark in the sector based on international standard quality clinical care offered by the medical experts, nurses, and the support staff at the hospital. Thumbay Hospital is one of the largest hospital in the region providing exceptional medical to all patients on a global level. The hospital has an experience of treating patients from over 175 nationalities and has diverse staff with employees from over 20 nationalities. The International Medical & Health Department at the hospital has a committed team which assist foreign patients throughout their journey starting from the visa and during their stay to till they reach home with improved health status. Nearest Airport: Dubai International Airport is 8.5 km away from the hospital and takes approximately 15 min to reach via road. Nearest Metro Station: Stadium Metro Station is just minutes away. 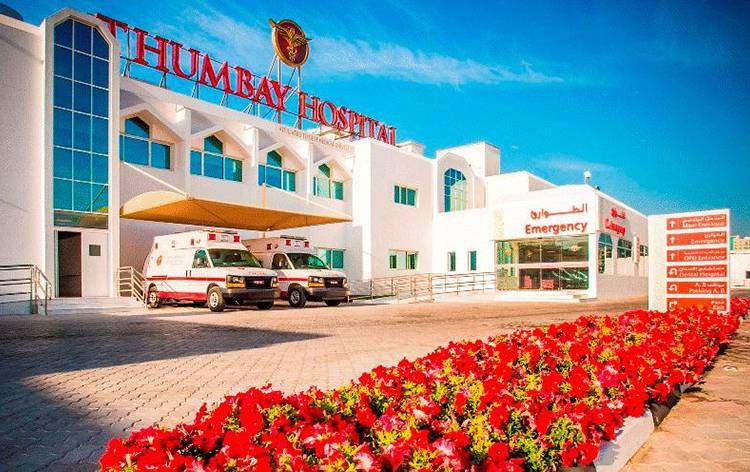 Thumbay Hospital performs 392 different procedures. Click on a procedure name to see more details and to view doctors for that specialty. 4.3 average based on 59 reviews.